Michiko Kakutani in The New York Times writes: "The poems in Mr. Vuong's new collection, Night Sky With Exit Wounds...possess a tensile precision reminiscent of Emily Dickinson's work, combined with a Gerard Manley Hopkins-like appreciation for the sound and rhythms of words. Mr. Vuong can create startling images (a black piano in a field, a wedding-cake couple preserved under glass, a shepherd stepping out of a Caravaggio painting) and make the silences and elisions in his verse speak as potently as his words...There is a powerful emotional undertow to these poems that springs from Mr. Vuong's sincerity and candor, and from his ability to capture specific moments in time with both photographic clarity and a sense of the evanescence of all earthly things." 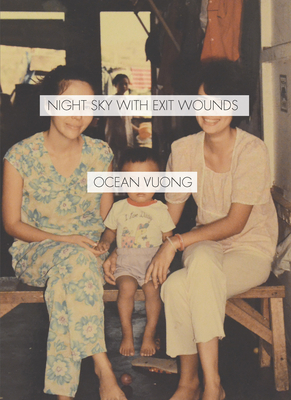 "Night Sky with Exit Wounds establishes Vuong as a fierce new talent to be reckoned with...This book is a masterpiece that captures, with elegance, the raw sorrows and joys of human existence." --Buzzfeed's "Most Exciting New Books of 2016"
Ocean Vuong: Born in Saigon, Vietnam, Ocean Vuong attended Brooklyn College. He is the author of two chapbooks as well as a full-length collection, Night Sky with Exit Wounds. A 2014 Ruth Lilly Fellow and winner of the 2016 Whiting Award, Ocean Vuong lives in New York City.